Some people might think driving a vintage car half way across the USA is a crazy idea. 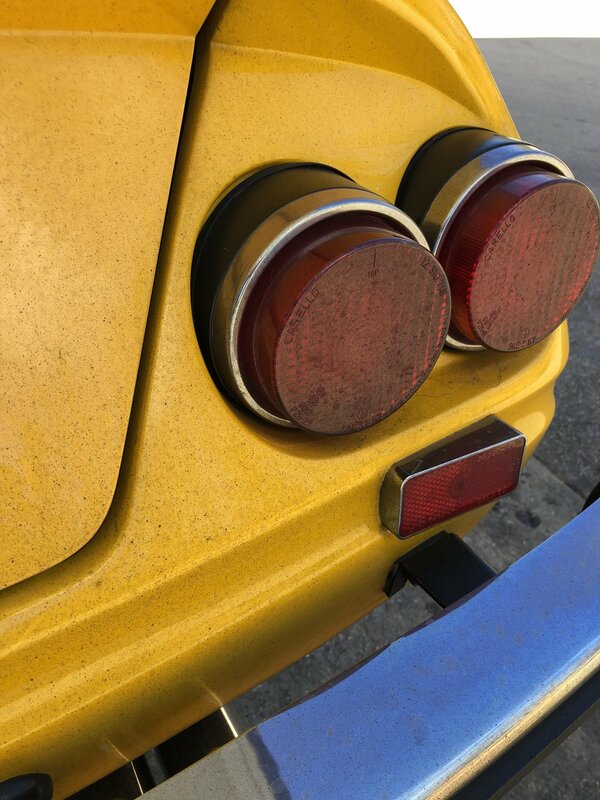 What if it's a 1972 Ferrari Daytona? Is it super crazy? Sure something could go wrong, but it's worth the experience. 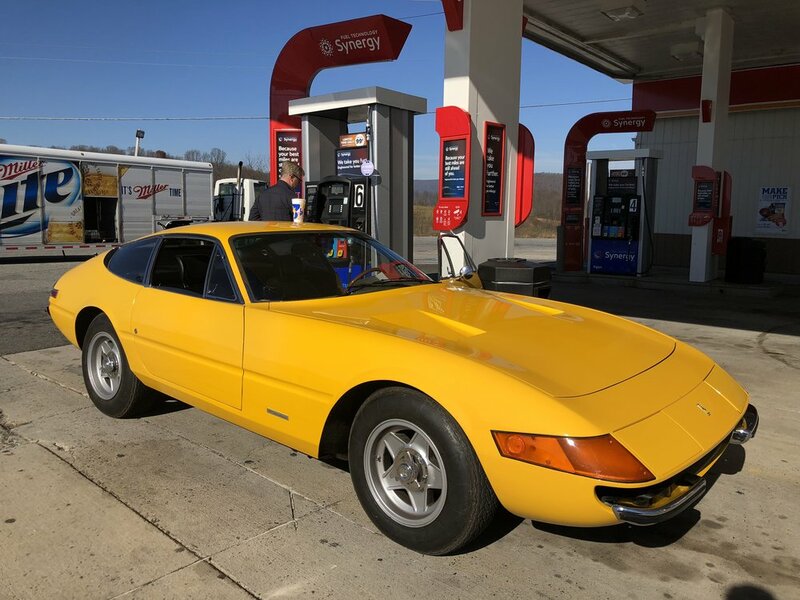 To back up a little, this 1972 Ferrari 365 GTB/4 was purchased in March of 2017. Little was known of the vehicle's service history, and although the car ran and drove okay, it still had issues and concerns. Todd, the new owner, wanted to enjoy the car, which meant he wanted to drive it. So, the decision was made to have the car properly inspected and serviced by someone that knows the Daytona. This is where Tom Yang and Francois Sicard came into the picture. Francois got his start with Ferrari in the mid 1960's with Luigi Chinetti Sr. and his North American Racing Team at LeMans. Francois has worked on everything from sports cars to Can-Am, to Formula 5000 and Formula 1 cars. In 1979, Francois opened his current business where it still resides. 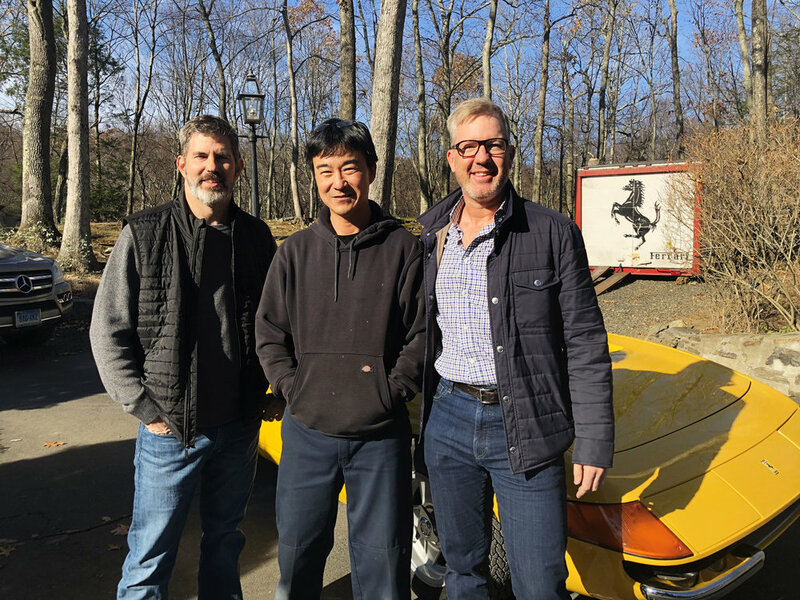 Tom Yang came along in the early 2000's and has since become a Ferrari specialist with a strong passion for vintage cars. 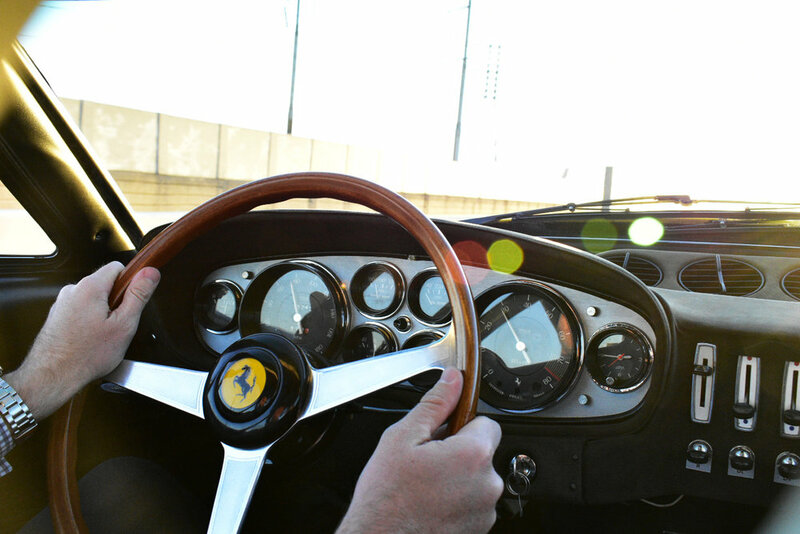 As an apprentice under Francois for more than 15 years, Tom has developed a deep understanding of vintage Ferraris. 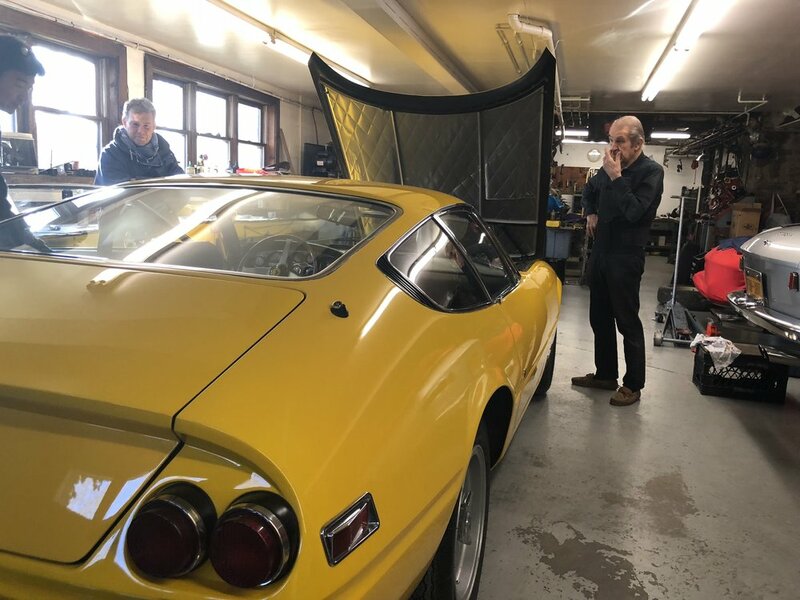 In June of 2017, the Ferrari 365 GTB/4 Daytona was transported to western CT for Tom and Francois to do a major service. 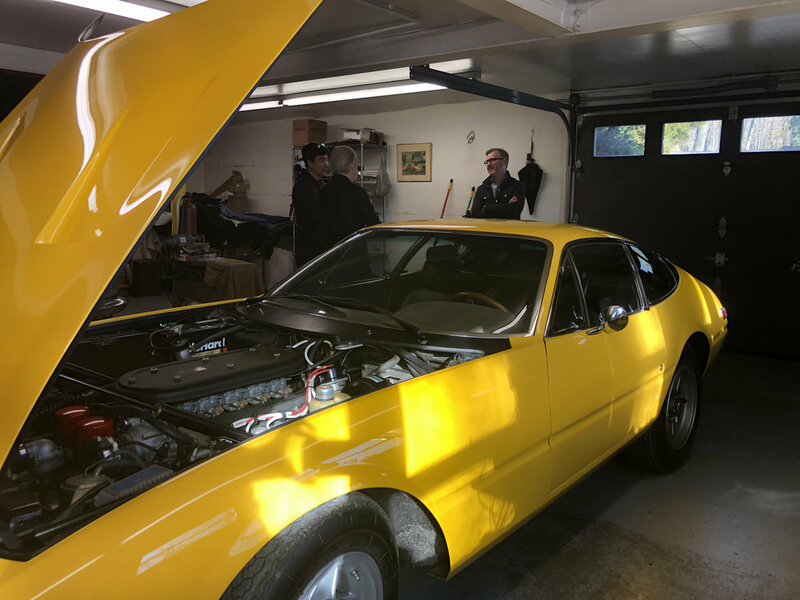 Since the goal was to have have a car ready to be driven, all of the mechanicals were inspected and serviced, with some items in need of reconditioning. A few other noteworthy concerning items were also repaired. The nice thing about working with Tom is he documents many of the service and repair items on his website, TomYang.net. 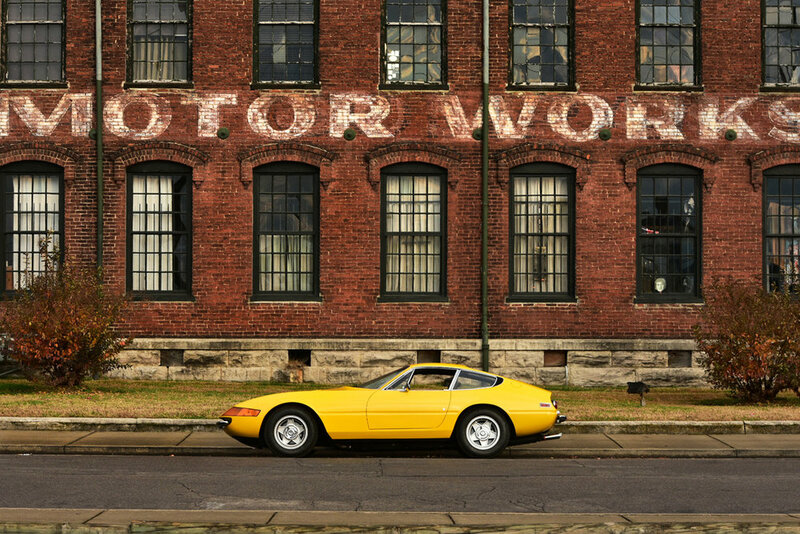 For car geeks of vintage Ferraris, his site is a great read and resource. A few months later, after all of the needs were addressed, the car was ready to be picked up. I asked Tom if he thought if Todd could drive the car back to Arkansas? Tom answered with a yes, even though it is an older car, it could be driven back to Arkansas. At that point, the idea was planted and the original plan of having it transported back to Arkansas was put aside. A date was set for Todd and I to fly to CT to receive the car and drive it home. A 1,500 mile road trip! The start of our half-Cannonball Run back to Arkansas, was on Tuesday at 9:00 am at Francois' garage. We realized we could have spent the whole day with Tom and Francois, but we had a long drive ahead. Time to hit the road. Note: Click on any photo to see a larger format. The first day was from Connecticut to Washington DC. The drive was about a six hour drive, mostly only highways. For the most part, the drive was uneventful. 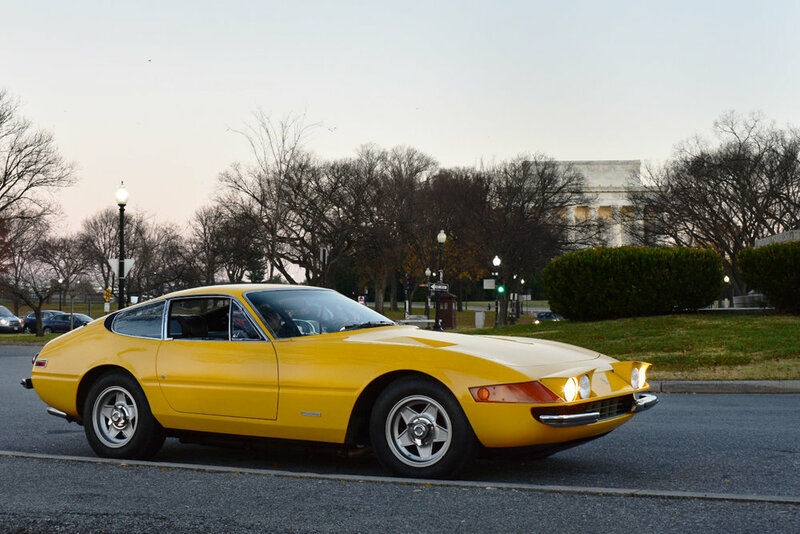 We did learn that Google Maps quickest route doesn't mean shorter time or ideal traffic for a Ferrari Daytona. This didn't matter too much because we weren't in a hurry. We just pressed on to Washington DC. Todd wanted to meet up with family in the city, plus they had a garage space for the car. 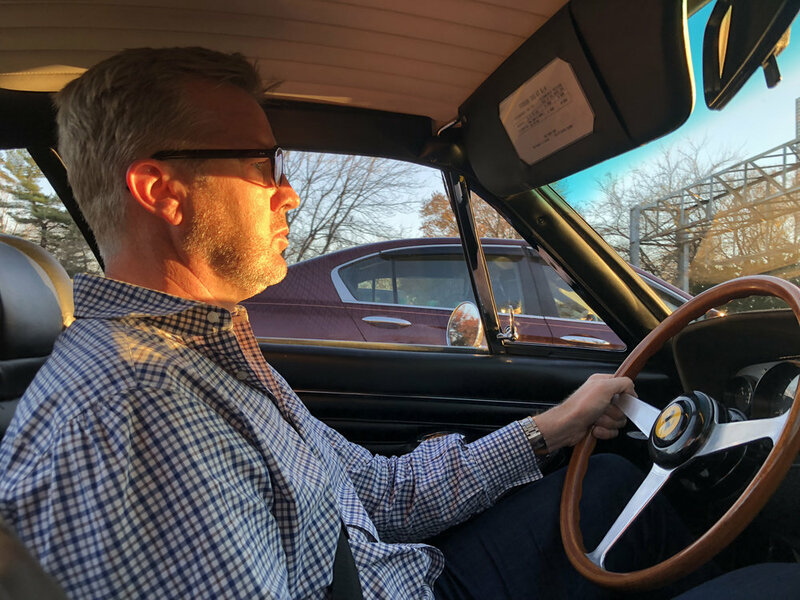 This meant we had to drive downtown and for those that know DC know driving a vintage Ferrari in city traffic can be challenging. By the time we got downtown DC, it was dark, traffic was busy and the progress was slow. The weather was so nice. 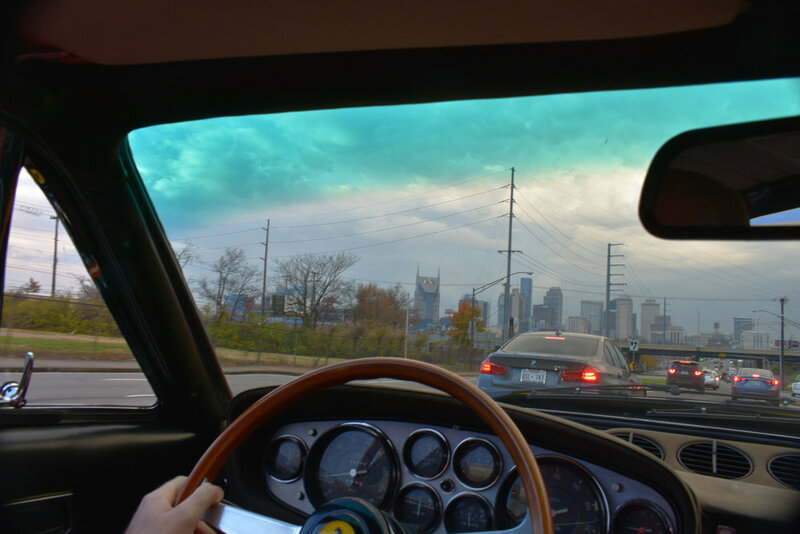 We drove with the windows down, and enjoyed the exhaust sound bouncing off the buildings. A great sound that you just don't get tired of. One draw back to the windows down, we did get some exhaust gases inside the car in the stop and go traffic. We finally made it to the parking garage safe and sound by 7:00 pm. Day two. We were up and ready by 6:00 am. 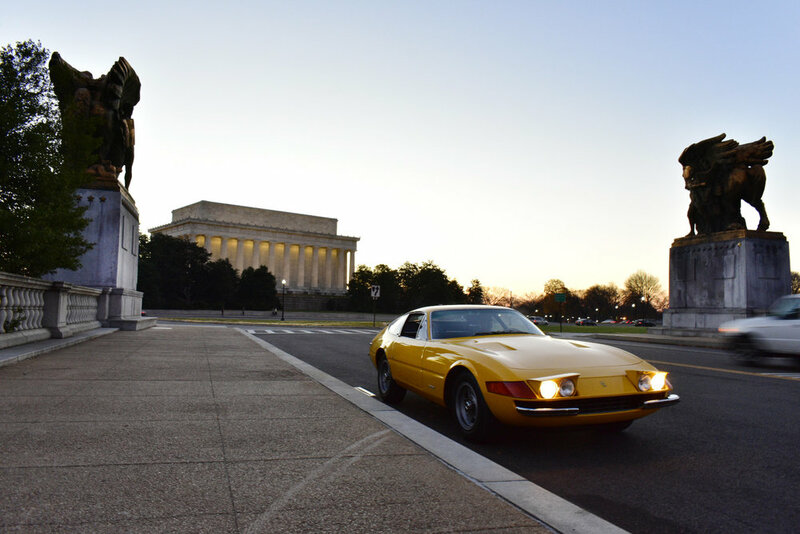 Drove the car to the nearest Washington DC landmark for some photos before heading out on the long drive to Nashville TN. To be honest, we both thought day two was going to be super long day, but it turned out to be a relaxing and enjoyable. Google maps estimated the trip to be about 11 hours, which is how long it took. This part of the trip is where we started to really enjoy the Ferrari. With less traffic and beautiful country we could explore the car's abilities as well as enjoy the view. The Daytona was very happy, and was great at any speed. It seemed happiest around 80 mph, but we had to watch our speed. With comfortable seats, easy to drive, not too noisy, and excellent outward visibility made driving the Daytona the ideal Grand Tourer. The reason our next stop was in Nashville TN was to see family and for another safe house garage for the car. Day three, leaving Nashville heading to Northwest Arkansas. The final leg of our half-Cannonball. When we stopped in Nashville at the garage, we found out we didn't have any tail lights or brake lights. So the first thing we had to do on day three was sort out the light issue. It didn't take long to have brake lights, but we learned if turned the headlights on we would lose brake lights. Clearly, we had an wiring issue, but with only 8-9 hours to home the little light issue wasn't going to stop us. As long as we got home before sunset, we would be good. In Nashville we took a few minutes to get some photos, just before the rain came. We knew we were going to have some wet travel, which was fine. 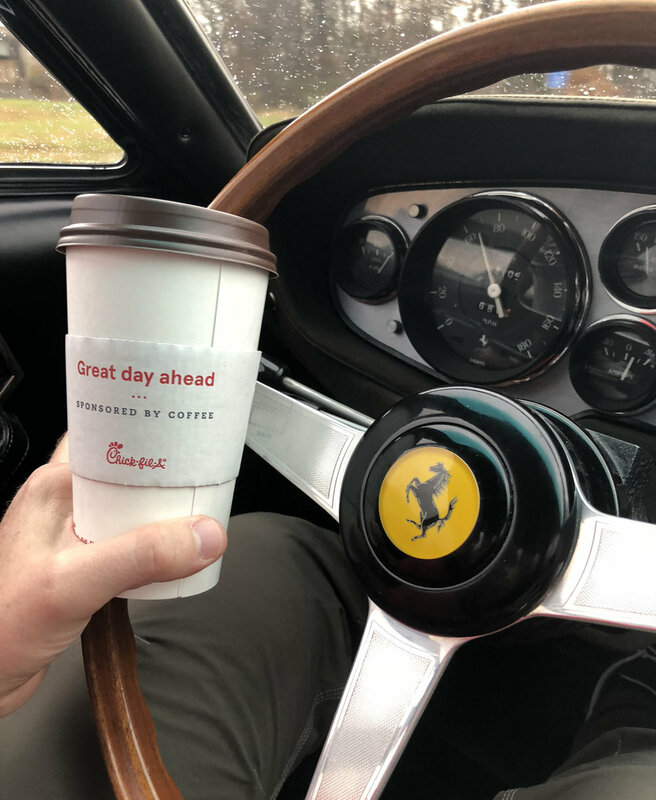 Something really cool about driving a vintage Ferrari in the rain. I guess it's because you know many Ferrari owners would never do it. 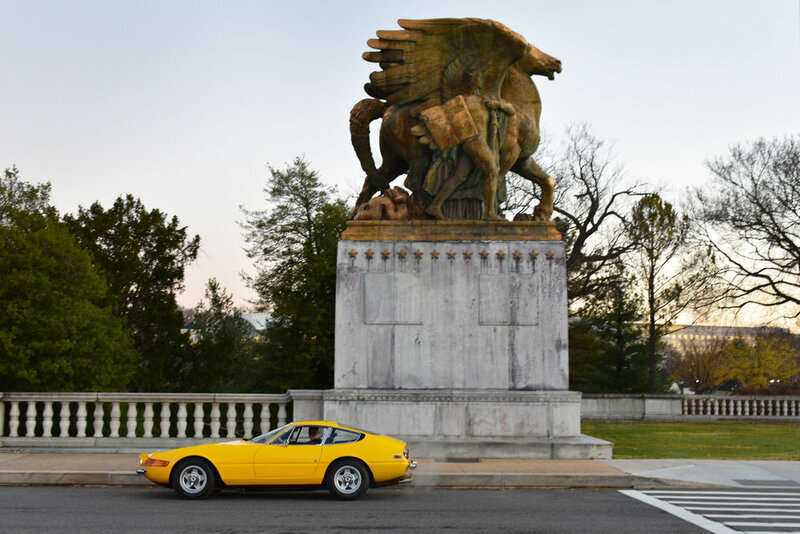 In some ways, driving a 45 years Ferrari across half the United States is a crazy, but Ferraris were built to take on long trips. For me, Ferraris are meant to be enjoyed, some like to work on them, some like to show them and some just enjoy being behind the wheel on the open road. Some naysayers would say driving an expensive vintage Ferrari 1,500 miles or more is just ignorant. Well, they have the right to say what they want. For me, it's just happiness (bliss). Todd probably said it best about this trip. 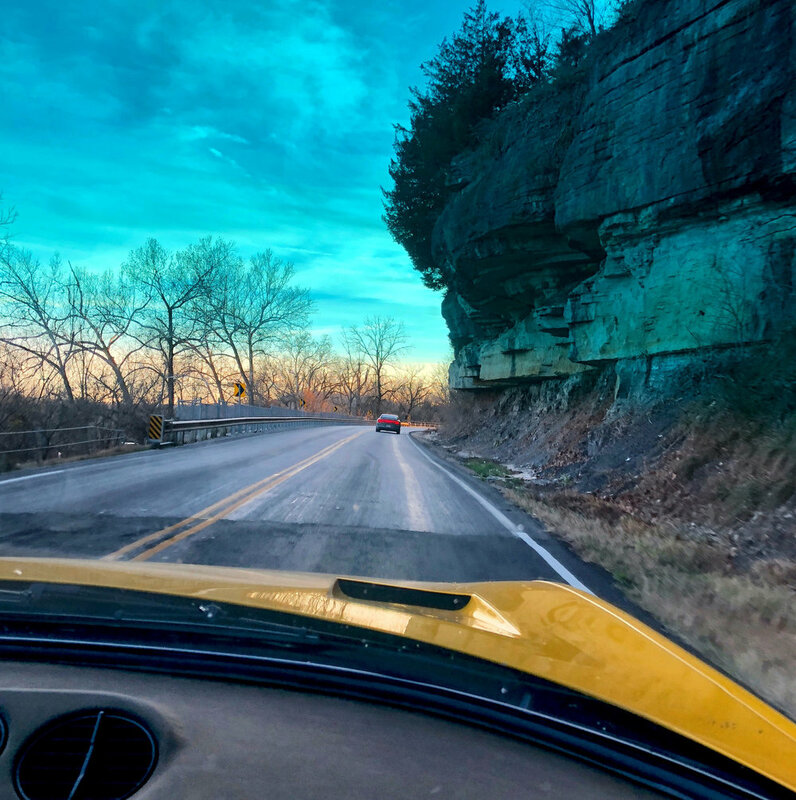 "I have always enjoyed driving my cars, but this trip has reminded me that life is short, and experiences like this are too few and too far between. I’m blessed to own a car like this, and to be able to take a few days and drive it like it was meant to be driven. To let it sit in a garage to me would be the worst thing I could do with it."